Listen now - free nature sounds and wild soundscapes recorded by Andrew Skeoch - birdsong, ocean surf, rain, forest, night sounds - ideal for relaxation, sleep, study or to feel the ambience of nature. Mp3 stream or download flac hi-res audio. Welcome to Listening Earth Play, where you can listen freely to a range of natural soundscape recordings from around the world. Sound stimulates the imagination in ways that images can't, transporting and immersing you in the presence of a wild place. Often, these locations are remote, and beyond our daily experience or ability to easily visit. Soundscape recordings offer an intimate experience of nature that is unique to time and place, and full of life. As a listener, you are not simply hearing the sounds of an exotic habitat, you are hearing the voices of life beyond your daily preoccupations. A good nature recording allows other species to speak for themselves, and remind us of why they - and we - belong on this planet. 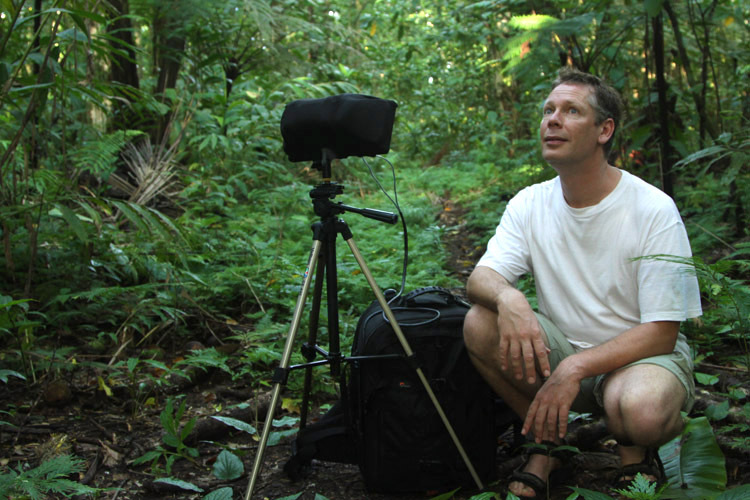 These nature recordings are the work of sound recordist Andrew Skeoch, and his partner, photographer Sarah Koschak. Through their label, Listening Earth, Andrew and Sarah have so far released nearly one hundred albums, the outcome of decades of work and field expeditions, representing wild locations across many continents from the tropics to the boreal tundra. These recordings, along with new releases, will progressively be added to Listening Earth Play. "In my field work, I attempt to capture the sounds of nature as you would hear if you were there. I use a pair of highly sensitive microphones, which in some aspects are more acute than our ears. These are mounted binaurally (ie; similar to our head and ears), so as to capture a rich stereo field and present a lifelike sense of distance and space. "My aim is to place the microphones in the landscape where the dynamics and balance of sound is aesthetically interesting. I prefer not to record creatures too close, but allow them to be heard in the context of the landscape. I also aim for movement, for instance placing microphones where birds may fly past creating left-right stereo movement. Then there is space and the reverberence of the habitat itself; the contrast between foreground and the softening of far off sounds. "Anticipating where sound may come from can be quite challenging. In some habitats, such as wetlands or waterways, the sources of sound are localised, and it is easy to position the microphones for a rich sound stage. In woodlands however, it may be less predictable, and the optimal spot more difficult to locate. "All this requires reading the habitat, anticipating where birds and animals will interact. Once the microphones are placed and the recorder switched on, I walk away, removing my presence from influencing creatures, leaving my equipment running for many hours at a time. "Sometimes I get it right, and wonderful recordings result. But whatever choices I make, I know that the secret to an exceptional recording is always persistence and luck - waiting for nature to do something serendipitous. "Over the years I have come to appreciate the silences of natural habitats as much as their activity. So I prefer to let you hear unedited recordings, where events occur at a natural pace, as this is true to nature and relaxes the mind. And of course, headphone listening is recommended." Each recording here is also available as an album that you can purchase and download. Due to the limitations of internet streaming, the audio has been encoded for optimal delivery. It should sound pretty good. However if you'd like to experience the clarity, depth and transparency of the original recordings, listen offline, or enjoy the convenience of owning them, then downloading is recommended. Just follow the purchase link for each album to the Listening Earth website*. "Listening Earth began as a commercial recording label, and continues to be. However by making these recordings freely available to a wider audience, we hope to promote appreciation of the natural world, and care for its conservation. We remain dependant on the support of our listeners to continue. Purchasing an album or two is a great way to assist our work, and we appreciate it." * Note: as you can only download and synch your devices on a desktop, our regular website is not optimised for small mobile screens. To help us improve this project, we’d welcome your constructive feedback. What did you enjoy? How could your user experience be improved? Which album you were listening to? In the depths of Thailand's Khao Yai rainforest, birdsong filters down from the dense foliage above like shafts of sunlight. Bulbuls, barbets, drongos, flycatchers, doves and laughing thrushes are heard calling occasionally during their forays through the canopy. Meanwhile a soft susuration of insects permeates the tropical air, and from far off in the distance come faint hints of gibbon song. This is a single, unedited recording; a spacious ambience that changes gradually as time passes. "This recording was made one morning while Sarah and I were photographing elsewhere in the forest. I left the microphones on just to see what they might capture. It was mid morning, and the rainforest was quietening down as the day progressed. At the time, I felt I hadn't got much at all - that it was all pretty quiet. "It was only later, when I listened afresh, that I appreciated how relaxing this occasional birdsong and spacious atmosphere is to listen to." Purchase and download this album for the finest audio quality, the convenience of offline listening, and adding to your music library.